In 2010, I was stationed at Kandahar Airfield, Afghanistan, which wasn’t far from some of the worst fighting in that country. I did OK there personally: my military position involved desk work, so other than having to hide in bunkers from oncoming missiles several times a week, I didn’t see much action and I didn’t come home with any combat trauma. But other people didn’t have it so lucky. Not too infrequently, the entire base would gather for a “ramp ceremony.” This event was what happened when a servicemember—usually American, and usually from the Army—was getting sent home in a flag-draped casket. If you think nothing else about how the military treats its troops, know that we handle our dead with an amazing about of dignity. Caskets are respectfully loaded onto a plane while “Amazing Grace” is played, and the remains of our dead are carefully sent off to their loved ones one final time. It’s beautiful, even as much as it’s gut-punchingly painful to watch over, and over, and over again. For a long time—since 9/11 and the ongoing Iraq and Afghanistan conflicts—we’ve had a bipolar view of our military. Some people utterly demonize the troops, seeing them as tools of an unjust public policy and full of rapists and killers. Others put the troops on a pedestal, viewing them as—pardon the term—Supermen and telling them “thank you for your service” as if it’s a holy invocation. The truth lies somewhere in between: the fact is, most servicemembers are just ordinary people who lead ordinary lives. We have spouses and kids, go to church, go shopping, watch movies, and other than the fact that we get sent to very nasty environments, we just want to live our lives and come home at the end of the day. 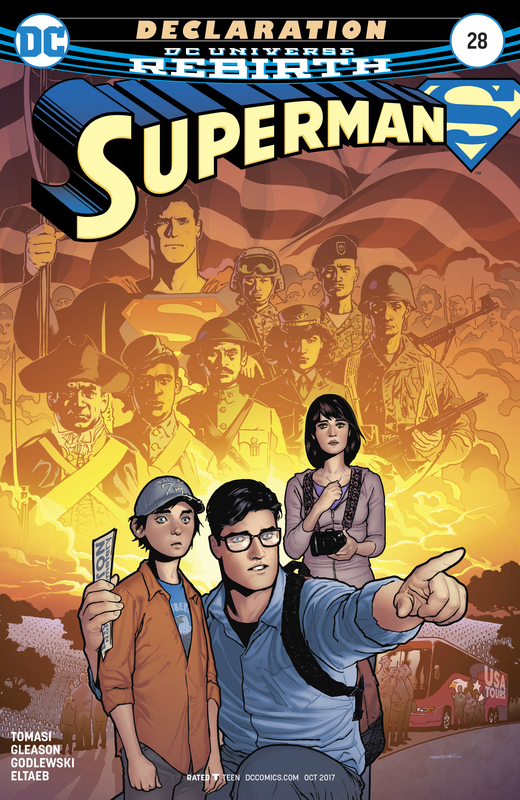 So anyway, Peter Tomasi and Patrick Gleason have taken a break in this month’s issues of Superman to give us a simple story about Lois, Clark, and Jon taking a road trip in an RV to see America, with a particular focus on its military history. Off the bat, let’s note that these “family” issues of Superman tend to be among the writers’ best, even though we haven’t seen one like this since the carnival issue back in #7. But it’s nice to take a break from the interdimensional travel, history alteration, space aliens, and other problems that have been plaguing the Kents for over the year. Despite being the mightiest family on Earth, Tomasi and Gleason have an amazing ability to present the Kents as exceedingly “normal”: just a mom and dad who are trying to raise their son right. In this case, issues #27 and #28 combined have the Kents teaching their son about the history of America through the eyes of its military: other ordinary folks who found themselves in extraordinary situations, and often paid the price for it. This is not something the Kents can easily appreciate: Superman’s wartime history has long been out of continuity, and the fact that Pa Kent’s Korean history is no longer referenced suggests it’s gone from history as well. Lois herself makes a point of honoring her father and uncle’s military service during a stop at the Vietnam Memorial in Washington, D.C., but otherwise: these are people who’ve seen action, not combat. Yet Clark and Lois are reporters and extremely empathetic: they may not have lived American history, but they know how to understand it and convey it to a little kid who’s trying his best to understand it all. What’s impressive is that Tomasi and Gleason take a surprisingly detached and nuanced view of America. In a way, this is like the classic Green Lantern/Green Arrow “Hard-Traveling Heroes” which gets the superhumans out of the clouds to see America up close. That story, though, took a very dim view of America, with Hal and Ollie stumbling into everything wrong with the country. Superman has Clark and Lois showing their son everything about America, both right and wrong. People fight unnecessarily, many of our wars are a mess, and people can’t agree on anything. But still, the rights of our Constitution allow us to be ourselves, even if the cost of that free expression is that we very publicly disagree with each other. And again and again, Lois and Clark remind Jon that the military fights for all walks of Americans, good or bad, right or left. The story reaches a powerful climax with Lois and Clark taking Jon to Gettysburg to show him the period where America warred with itself, and soldiers were called upon to fight their own countrymen. There, they meet an ordinary family who gathers at the battlefield every year to honor an ancestor who died at the battle and whose body was never recovered. It’s here that Tomasi and Gleason capture the fidelity of the POW/MIA efforts, which continues to recognize that some military members are lost, and not even their bodies come back. A report from 2014 indicates that some 83,000 troops are still listed as “missing in action” since World War II: a sobering statistic on how many families have never gotten complete closure on a missing loved one. Obvious spoiler alert: at the end of the story, Superman—in one of his classic moments of compassion that only Superman is capable of—tracks down the long-dead soldier’s remains and delivers them to the family, respectfully draped in an American flag. It’s science fiction, and most families don’t nearly get that lucky. But still, Tomasi and Gleason very touchingly capture the spirit of how America reveres its dead, ordinary citizens who don’t get to come home alive. Speaking as a longtime comics reader, I can probably count on one hand the number of comic books which have moved me to tears. Superman #28 is now one of them. These two issues of Superman are an extraordinary piece of storytelling about ordinary people, and wonderfully captures America’s history in a way that lets the ever-growing number of people with no military service understand what the military is all about. I would encourage DC Comics to consider collecting these two issues by themselves, maybe in a hardcover format, and offering it at Military Exchanges so that troops can have the very cathartic opportunity to read it. But to the rest of the public, I’d encourage you to buy these issues and very carefully read them. 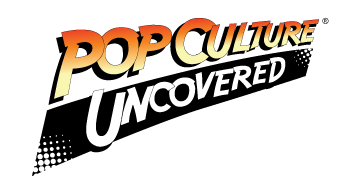 They’re far from the most controversial Superman comics ever written, and they won’t make tremendous waves compared to whatever issue of Batman or The Walking Dead are on the stands this week. But it’s a good story, and an important one nonetheless, and one that I’m grateful that Tomasi and Gleason decided to tell. Rating: Five capes out of five.